Using Leftover Chapatis to Make Tasty Snacks! Never throw extra leftover chapatis out again. Use them to make an Indian-style chip and dip or quesadillas instead. This leftover chapatis recipe can help you repurpose your chapatis into something new -- and quite delicious. Also known as chapati, chappati, chapathi, chappathi, roti and chapatti, chapatis is an unleavened flatbread that is a popular staple everywhere from Sri Lanka and Bangladesh to Pakistan and India. It is also common in South Asia and Nepal. Depending on where you are, the thickness of chapati can vary. They are made from a dough that incorporates atta flour, water and salt. The flour is made from wheat and is more finely ground than whole wheat flours commonly found in the U.S. The dough is rolled out and then made into balls that are flattened and formed into discs.The disks are about 6 inches in diameter, though sizes can be different depending on regions. Then the chapati is rolled out using a belan (rolling pin) into circles. It is next cooked in a dry tava and cooked on both sides. Some cultures put it directly on the flame so it inflates. After cooking, the bread is then topped with ghee or butter. When you make a lot of chapati, though, you don't have to throw it out. Let's talk about some leftover chapati recipes. To convert the old chapatis into the "chips" for your chip and dip, cut them into triangles and lay on a lightly greased baking sheet/ tray. Preheat your oven for 10 minutes up to 375°F. Place the baking sheet or tray in the oven and bake the flatbread until it is crisp and lightly golden. 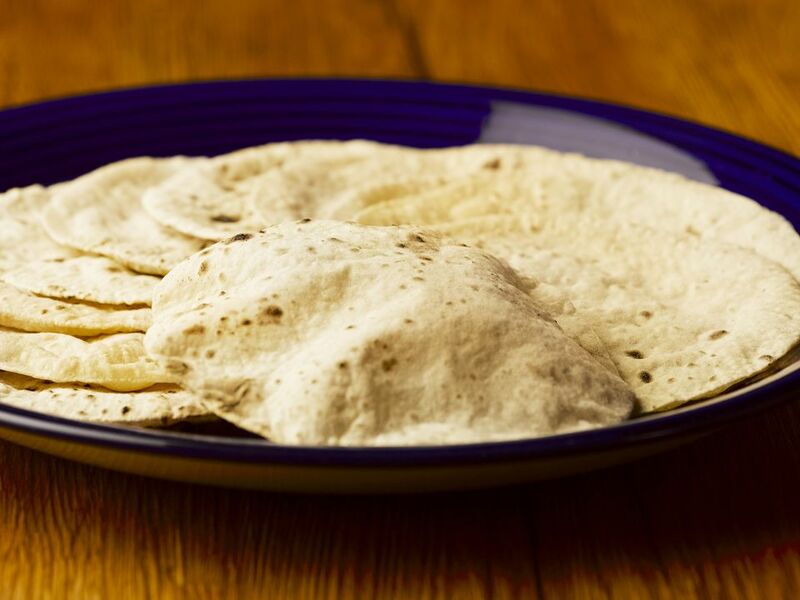 To make Indian-style chapati quesadillas, lay the chapati on a clean surface. Place any leftover vegetable or meat, add cheese and your favorite chutney. Fold it in half and place it on a plate in the microwave. Cook on high for 10 seconds or till cheese melts. Cut the chips into triangles and serve. Another handy tip for using old chapatis is to convert them into mock "bhakris" (crispy savory flatbread). To do that, simply heat a pan or griddle and toast the chapatis on it. When it is almost done, brush it lightly with butter or ghee and sprinkle the bread with a mix of equal parts of red chili, turmeric, coriander, and cumin powders as well as salt to taste. Continue toasting till very crisp. Eat as is or break it into pieces and serve with a dip. As you can see, there are many ways to use leftover chapati into something completely new. This versatile flatbread is not only good the first time around in a meal -- it is a great leftover staple that can be easily transformed into a brand new meal or snack.